James, R.D.. "Tanager". The Canadian Encyclopedia, 30 May 2018, Historica Canada. https://www.thecanadianencyclopedia.ca/en/article/tanager. Accessed 22 April 2019. The tanager (Thraupidae) is a family of small songbirds, possibly comprising as many as 413 species. 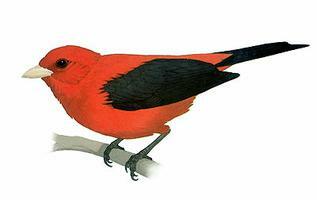 Scarlet tanagers are the only tanagers known to undergo pronounced seasonal molt (Macmillan Illustrated Animal Encyclopedia). The tanager (Thraupidae) is a family of small songbirds, possibly comprising as many as 413 species. The family is sometimes given subfamily rank. Tanagers are found only in the Americas, largely in tropical regions. 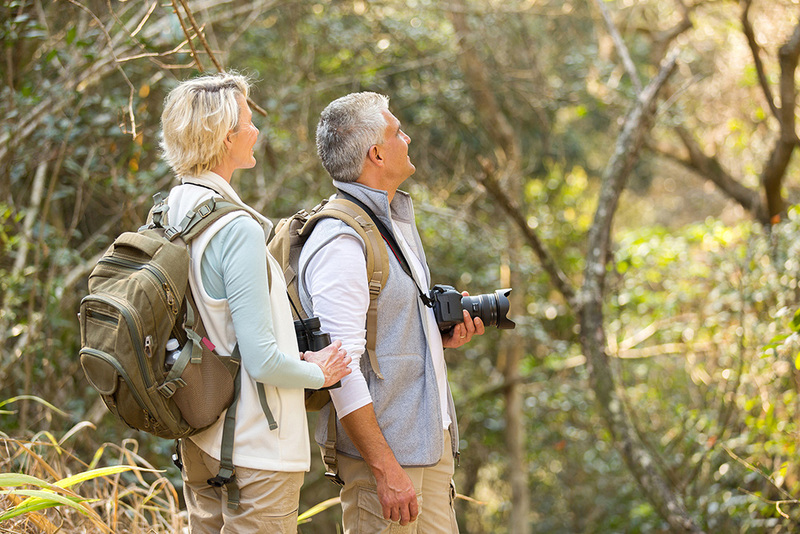 Tanagers are mainly nonmigratory, arboreal birds which eat insects, fruit and flowers. Many tangers are brightly coloured, often in boldly contrasting, solid patches. Bills are typically short and conical with a notch or "tooth" on the upper jaw. They are not noted as singers; songs are robinlike, but hoarser. 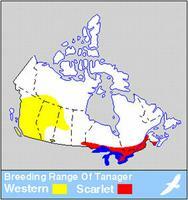 Only 2 migratory species (genus Piranga) breed in southern Canada (a third, summer tanager, P. rubra, occurs occasionally in southern Ontario and as an accidental in other provinces). The bright red, yellow and black western tanagers (P. ludoviciana) breed in coniferous woods from British Columbia to Saskatchewan; the red and black scarlet tanagers (P. olivacea) prefer deciduous forests from Manitoba to New Brunswick. Females of both species are olive green. Scarlet tanagers, the most migratory of the family, belong to the only species known to undergo a pronounced seasonal molt, with males also becoming olive green in winter. 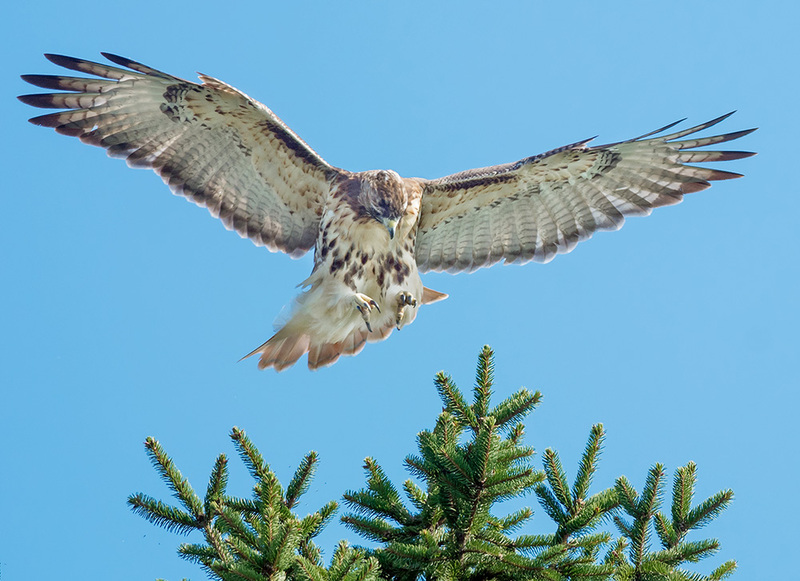 Nests are loosely constructed of small twigs and are placed 3-30 m high in trees. The pale blue, brown-spotted eggs are incubated by the female for about 2 weeks. 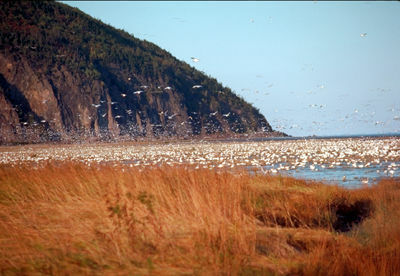 Males assist with rearing young.